Below we list current CD rates, offer a graphical calculator, and a CD ladder calculator. Are you thinking of buying a CD? Use this free calculator to find out how much interest you'll earn. For a given deposit and interest rate we'll calculate your annual percentage yield (APY) and balance. Click the 'View Report' button to see your detailed schedule. This page also provides a calculation tool to estimate interest income, and a CD ladder calculator to highlight the expected blended yield of various ladder configurations. The following table highlights current rates, which can give you a snapshot of what you could expect investing today. You can use these figures to calculate your blended returns on various CD investments. Investing in the stock market can bring big returns — especially if you land on a hot stock before the public learns about it. However, investing in the stock market can also lead to big losses. Saving your money is a safe bet, but most savings accounts have very low interest rates — if they pay interests at all. A certificate of deposit is a savings certificate backed by the Federal Deposit Insurance Corporation (FDIC) or the National Credit Union Administration (NCUA). CDs issued by banks are insured by the FDIC, and those issued by savings accounts are insured by the NCUA. CDs are issued for a fixed term — anywhere from one month to five years — and pay an annual interest rate. 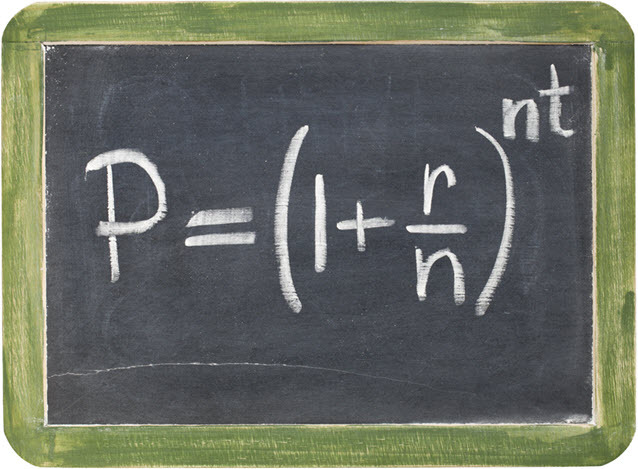 Typically, the larger the principal you purchase, the higher the interest rate you can expect to get. And the longer the term you loan for the higher the rate you can obtain. While the highest interest CDs may still under-perform the stock market, they are considered a low-risk investment since they pay out a sure return. In most cases, you cannot withdraw before it has reached its term without incurring hefty penalties. You also have to pay taxes on any dividends you receive when you cash it out. If you want to keep your capital more liquid, you might want to consider a money market account. If you are fine with having your capital locked up for a longer period of time, you may want to consider bonds. There are several types of CDs in addition to the traditional one, some of which allow you to withdraw funds early without penalty and some that offer flexibility in interest rates. Brokered CD: Though traditional CDs are purchased from a bank or credit union, these are purchased from a brokerage. Brokered CDs typically carry a higher interest rate, but you will have to pay a fee to buy them. Bump-Up CD: If interest rates rise for CDs of similar length, a bump-up CD allows you to swap out your CD for a newer one with the higher interest rate. You typically can only “bump up” once during the term. Callable CD: Banks can recall this type of CD at any time by paying you the original deposit and any interest you earned. Typically, banks recall a CD because interest rates have dropped significantly. However, callable CDs typically start with a higher interest rate to make them more attractive to buyers. Liquid CD: With a liquid CD, you can withdraw a portion of your deposit without incurring a penalty. This is a good choice if you want to ensure you have some access to your money in case of a financial emergency. Zero-Coupon CD: Instead of earning annual interest, this CD reinvests the earnings from your interest so you have a higher deposit and can earn even more interest. CD products may have interest compounded daily, weekly, monthly or annually. Interest which compounds more frequently achieves a higher annual percentage yield (APY). This graph illustrates how more frequent compounding leads to a higher effective yield. The above graph uses a 20% rate of interest. The same trend applies at other rates of interest, but the lower the rate of interest the less impact the compounding frequency will have on the overall return. The following table compares APR to APY for various compounding frequencies for 1%, 2%, 5%, 10% & 20% APR. You can use the automatic calculator at the top of this page to see how changing in compound frequency impacts the APY for a given rate of interest. 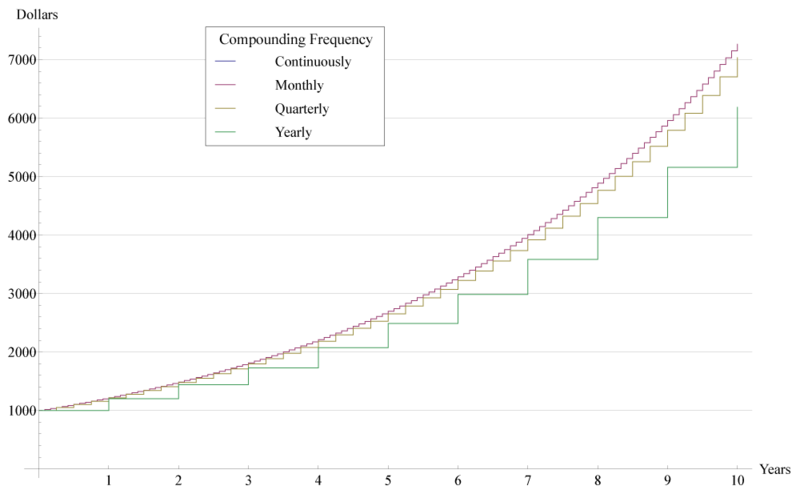 Investors who have regular cashflow needs but want to put their capital to work in low-risk investments can create a ladder of bonds and CDs to where they have a set amount of issuance maturing each year, to where they can spend some of their interest income & reinvest a portion (or all of the) principal at then prevailing rates. Purchasing CDs is a great way to build income while protecting your savings. You will need to invest a sizable amount of money or to keep your money invested for a long time in order to make any significant returns. However, even small gains can help you to work toward your financial goals, such as saving for the down payment on a home or paying off your debts to build your credit. Use the calculator above to find out just how much you can earn and how quickly you can build the savings you desire to meet your financial goals.